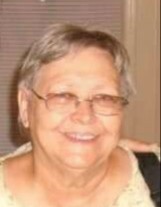 COWPENS, SC: Vida Katherine Price McArn, 74, wife of Carl E. McArn, Sr., passed away May 29, 2018 at Regional Hospice Home. Born in Knoxville, TN, she was the daughter of the late John Price and Carrie Spencer Price. She was a member of Salem United Methodist Church and a former nursing assistant. In addition to her husband she is survived by two sons, Carl McArn, II, of Cowpens, SC and John McArn of Tacoma, WA; three daughters, Noor Kahn of Manassus, VA, Amanda McArn and Dora Bowman both of Cowpens, SC; a brother, Victor Price; sisters, Heloise Luton and Mary Geisler; eleven grandchildren and eight great-grandchildren. She was predeceased by a brother, James Price. Celebration of Life, Saturday, June 30, 2018, 5:00 p.m. at Salem United Methodist Church, 5425 N. Main St., Cowpens, SC, 29330, with Rev. Wayne Major presiding. In lieu of flowers please make donations in Vida's memory to Salem United Methodist Church or Richton United Methodist Church, PO Box 515, Richton, MS, 39476.